"I graduated from Bakersfield High in 1997 (where I have now taught for 7 years)! I never thought I would teach at the very high school I attended. I then when to BC for two years and then off to San Francisco State graduating in 2002. I returned and earned my credential and then my MA in Education from La Verne in 2009. My business partner Vikki Cruz went to Garces then BC then graduated from Berkeley in 2002. 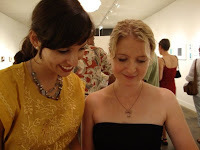 Even though we have a lot in common including our close birthdays (mine is Dec. 25th and hers Dec. 23rd), we didn't meet until 2008 when we opened Surface Gallery. We wanted to be a part of the Arts District and thought of no better spot to open Surface than downtown. " "I came to Bako in 1976 at the age of five. Left to go to school at Washington State University in 1993. My future wife, born and raised in Bako, followed me to WSU in 1994. We moved to LA after school in 1998. Moved back to Bako in 2002 to raise our family. We swore that we would never come back, yet here we are. 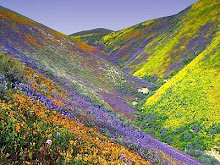 Despite the poor air quality and sweltering summers, it is a great place to raise a family." * ... MACEY HOMEWARD BOUND: I was happy to hear that Macey Kibbee, the college sophomore at Long Beach State who was critically injured in a car-pedestrian accident earlier this month, will be heading home in a week or so. I have been following the 19-year-old's amazing recovery from traumatic brain injuries on the family blog (read the latest post here). Macey was hit by a car while jogging in Long Beach and has been at Long Beach Memorial ever since. When she comes home, she'll face a long rehabilitation at the Centre for Neuro Skills in Bakersfield, which has mended many of our young people over the years. Here's to a fast recovery and a wonderful 2010 for this former Stockdale High School Mustang. * ... HAPPY NEW YEAR: I view 2009 a bit like the uninvited guests who came for a weekend and stayed a month. By the time they leave, you've grown so weary you never want to see them again. Besides the dismal economy - and it will eventually recover, if not this year then next - I know far too many people who have encountered personal crises of health, family, relationships or employment. So let's all take a deep breath and take a moment to appreciate all the blessings we do have. My warmest wishes to everyone for a prosperous 2010, and let's never lose sight of what is really important and where we all derive our strength and purpose. Onward. 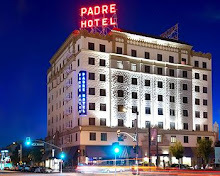 * ... MORE ON THE PADRE: I ran into Steve Uricchio this week and got a run-down on the plans to reopen the old Padre Hotel downtown. Construction delays prevented the much anticipated New Year's celebration, but Steve now says there will be a "soft opening" on Wednesday, Jan. 20. Steve is the hotel's food and beverage director and says there will be three restaurants and two bars, including a bar on the second floor which will also house a banquet facility. The ground floor facilities include a casual dining restaurant and a more formal restaurant along with two bars. He promises the hotel will be "stunning" and says the new executive chef, Darrell Jensen, has a proven track record in the Colorado mountain resort communities. There will be ample parking with the Padre striking a deal with the city for using the garage next door, plus there will be valet parking. The hotel rooms, according to Steve, will not open until February, a bit later than the bars and restaurants. Meanwhile the old Padre is getting some new awnings as workers rush to meet the new deadline. Stay tuned. * .. HOME DEFAULTS: While we are looking for good news, I heard that the Office of Thrift Supervision reported that second quarter "re-default" rate on modified mortgages - that means at least 60 days delinquent and three months past restructuring - fell from 30 percent to 19 percent. Good news? Let's hope so. The past year has been a nightmare in the local real estate market, with the lion's share of sales (70-plus percent) coming in properties in some form of foreclosure. Let's all hope for a better 2010. * ... BAKO OR BAKERSFIELD? Local reader Stephen Montgomery wrote me about his friend who now lives in Fresno. "He regularly calls Bakersfield 'Backwardsfield,' a term that makes me grit my teeth. 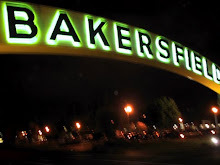 While I often call it Bako, as a member of the city's Keep Bakersfield Beautiful and active in pubic issues usually related to urban planning, I'm more interested in making Bakersfield a better place to live rather than dismiss it for its faults. Needless to say I took pleasure in referring to Fresno as 'Frezburg.' John didn't comment but if I think of something better he'll hear it." * ... THE BUZZ: With New Year's eve approaching, we all need to be diligent while driving, particularly if we have had anything to drink. If you are out and want to be safe, keep in mind a company called Designated Driver of Bakersfield Inc. that offers a terrific new service locally. Give them a call and they will not only pick you up and take you home, but also have someone drive your car as well. The base costs start at $45 but the company also offers "memberships" in which you get some rides free and others at discounted prices. Check out the company website here. It's worth considering. A friend sent me a link to an amazing insider's story from the Puget Sound Business Journal of how JPMorgan Chase took over the failing Washington Mutual financial empire. A key part of the story: apparently JPMorgan executives had insider knowledge about a liquidity run on the bank, allowing them to buy WaMu for pennies on the dollar. (read the entire post here) If this is true, it makes once wonder about the deals federal and state regulators are cutting with the institutions taking over the hundreds of banks that have failed this year. It's worth the read. - Local businessman Marvin Steinert, already one of our community's most generous benefactors, who had to deal with a rare illness that left him blind literally overnight. Marv responded by focusing on his faith and continuing to support our local non-profits, including writing a $50,000 check to the new children's medical center at Memorial Hospital. - Local community activist Wendy Wayne, who continues to show an indomitable spirit in the face of her own fight with cancer. Wendy does more for our community in a year than most of us do in a lifetime. - Judi McCarthy, who almost single handily kept the Kern Community Foundation going through a tumultuous year and whose sole goal is to provide resources to help others. - Horace Mitchell, president of Cal State Bakersfield, who has laid out a clear vision for the university and guided it through a most difficult period. He has taken the heat for state budget cuts, but his vision has been unwavering. - Don Martin, the owner of Metro Galleries downtown, who kept all our spirits high by helping revive the downtown art scene through sheer will power and clever marketing. - All the service clubs in our community - Rotary, Kiwanis, Lions etc - whose only reason for existing is to build up our community. - Bernie Herman, executive director of the Bakersfield Museum of Art, and his talented staff who brought our community a level of fine arts that we have never seen and in turn made us all better. - Watson-Touchstone Realtor Mary Christenson and all her colleagues who somehow managed to stay upbeat in the face of a dismal housing market. - We lost so many good people this year - John Petrini (last December), Shirley Ann Fiddler, Janice Jay, Lenore Carter, Donna Corum, Stan Simrin, Alton Saceaux, just to name a few - let's keep their memories alive. Their lives all enriched our community. "When I became president of the Foundation on January 1, 2004 our balance was $140,000. Today we have more than doubled the corpus-we now have over $300,000! During this time, we have donated over $300,000, mostly to youth programs in Kern County (we have made a few other contributions, including a donation to the Rotary Polio Plus program). I share this with you, because the success we have had can mostly be attributed to the members and spouses of Bakersfield West Rotary as well as the other eight Foundation board members." * .... BAKO OR BAKERSFIELD? Reader Virginia Smith writes in: "From a native of the East Coast: Boston has learned to accept 'Bean Town' Natives of Maryland much prefer 'Balto' to the soubriquet recently given to Baltimore by the NY Times: 'Crabcake Corners.' And Alabamians were distraught by the name used for their largest city during the violence of the civil rights movement in the 1960s: 'Bombingham.' Be happy with 'Bako;' it could be much worse. Remember Johnny Carson?" 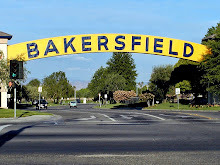 Yet another reader, John Strand of Lake Isabella, hates the term "Bako" and offered me this advice: "Bako instead of Bakersfield is like using Bean-O instead of Beene. Maybe this thing will die a natural death." Thanks John, but some of my dearest friends have called me "Bean-O" for years, and you can too. I won't take offense.